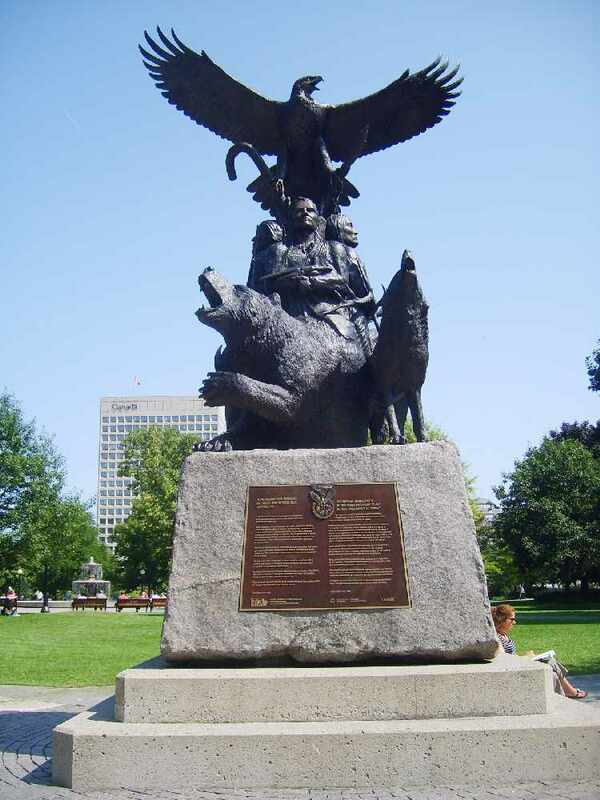 The National Aboriginal Veterans Monument stands in Ottawa as a permanent fixture to recognize the unique contributions and experiences of Canada's Aboriginal war veterans. The monument was sculpted by Saskatchewan artist Lloyd Pinay of Ojibway, Cree and Sioux decent. His father was a veteran of the Second World War wounded in combat. The statue of bronze and stone stands five metres tall and weighs 2,000 kilograms. There are four human figures carved, representing First Nations, Métis and Inuit. The monument honors veterans of the first and second World Wars, the Korean War and the peacekeepers. Five animals encircle the figures—the eagle, bear, wolf, bison and elk. The eagle symbolizes the Creator and occupies the highest placement on the monument. Two of the individuals are holding instruments of war. The other two hold items of peace. Balance is the overall theme of the monument. The monument unveiling on June 21, 2001 was the final stage of a long process, beginning five years ago. The Monument Project was officially announced on Nov. 4, 1996 by then-Indian Affairs minister Ron Irwin and National Aboriginal Veterans Association president Sam Sinclair. NAVA president of the time Claude Petit joined Irwin and Sinclair at the sod-turning ceremony on May 8, 1997. The monument stands as a testament to the debt all Canadians owe to its veterans. During the First World War at least 3,500 Aboriginal men, one-in-three of the able-bodied men on reserve, enlisted for service, making it the highest ratio among all Canadian ethnic groups. Another 3,000 enlisted in the Second World War and 500 in the Korean War. More than 500 Aboriginal soldiers gave their lives during those wars. Many Native recruits were unfamiliar with Euro-culture and had to adapt quickly to their new environment. The hunting skills required on the reserve proved to be a valuable asset for the allied war effort. It was found that Aboriginal soldiers made for skilled marksmen and exceptional reconnaissance scouts, and were superior for covert activities. Aboriginal languages contributed to the war effort as demonstrated by the Cree and Navajo 'code-talkers' who would safely relay allied communications. Francis Pegahmagabow, with 378 hits, and Henry Norwest, with 115 confirmed kills, were perhaps the most proficient snipers for any side during the First World War. Long distance runner Tom Longboat served exceptionally well as a runner and scout. In the Second World War and Korea, Tommy Prince became Canada's most storied and decorated Aboriginal soldier. Like most Indian veterans, both Pegahmagabow and Prince would return home to poverty after the war. The dream of a new progressive and equal relationship with the rest of Canada would go unrealized. Not only were Indian veterans living on reserve disqualified from the $6,000 loan entitled to all veterans, their veterans' pensions were also reduced. After the First World War, the Soldier Settlement Board bought 85,000 acres of lands in order to give it to returning veterans. Almost all of those that benefited were non-Native. The unveiling ceremony of the National Aboriginal Veterans Monument consisted of singing, drumming and speeches. Governor General Adrienne Clarkson delivered a somber yet stirring address. She paid homage to the "thousands of miles that Aboriginal soldiers traveled over the course of more than two centuries to help defend this country (which) make up a thousand memories, so much of which has been ignored or lost . . . They stood shoulder to shoulder in mutual reliance and trust with their fellow soldiers. They paid the supreme sacrifice, so that we could live in peace, in security and in freedom." "This monument is raised in sacred and everlasting honour of the contributions of all Aboriginal Canadians in war and peacekeeping operations . . . They served with honour and distinction in all branches of the service from private to brigadier . . . Hundreds from across Canada gave fully of their lives so that all Canadians might know peace and inherit freedom."